Salt Lake City — On Saturday, March 24, Invicta Fighting Championships made its first trip to the state of Utah, hosting Invicta FC 28: MIZUKI vs. Jandiroba from the Union Event Center in the capital of the Beehive State. The event streamed live and exclusively on UFC Fight Pass beginning at 8 p.m. ET. 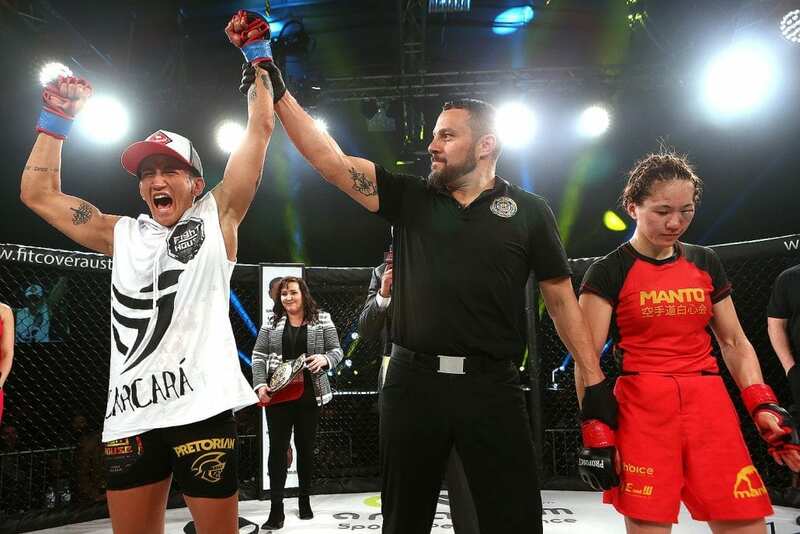 Undefeated Brazilian Virna Jandiroba is the new Invicta FC strawweight champion after largely dominating Japan’s MIZUKI from bell to bell. Jandiroba took the fight to the mat effortlessly throughout the entire five-round affair. A right hand from Jandiroba damaged the left eye of MIZUKI early in the fight and it swelled badly. Jandiroba was methodical with her top pressure, smothering MIZUKI from generating offense or returning to her feet. The best chance for MIZUKI came in round four, as she scored with a beautiful hip toss, but Jandiroba quickly reversed the position and continued her dominance. When the scorecards were revealed, it was the Brazilian who left with the win and the belt. Former title challenger DeAnna Bennett returned to the promotion and snapped the winning streak of Mexico’s Karina Rodríguez. Bennett surprised the Mexican fighter with a steady forward advance, landing punches and initiating the clinch. Bennett scored with a big takedown, but Rodríguez quickly bounced back to her feet. The second round was more of the same as Bennett’s frequent level changes and feints prevented Rodríguez from putting together her boxing combinations. Rodríguez increased her output in the final round, but Bennett’s wrestling and clinch game was too much. The judges were split, but it was Bennett who left with the win. 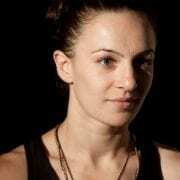 Veteran Milana Dudieva gave Christina Marks a rude welcome to the Invicta cage, earning a second-round TKO victory. The flyweights spent the first round in a feeling-out process, trading single strikes and gauging range. It was more of the same in round two, but late in the frame, Dudieva delivered a massive right hand that sent Marks crashing to the ground. Dudieva followed with a series of right hands to finish the fight. Pearl Gonzalez outworked Kali Robbins in a three-round war to introduce herself to the strawweight division. The previously undefeated Robbins waded through the strikes of Gonzalez to impose her grappling attack in the opening round. Gonzalez was able to defend from her back and reverse position multiple times. As the fight progressed, Robbins began to give Gonzalez more openings for scrambles and Gonzalez capitalized. She spent the better part of the last two rounds in the top position, cruising to the decision win. 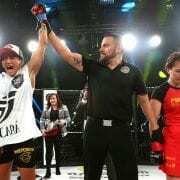 Finnish atomweight Minna Grusander impressed in her promotional debut, stopping her fellow newcomer Fernanda Barros by TKO. Barros was very aggressive to start, coming forward with looping punches and kicks. Grusander survived the onslaught and the pair traded guillotine attempts. In the second round, the Finn found her range on the feet, dropping Barros with a flurry midway through the round. She increased her output, pounding out the Brazilian along the cage to earn the TKO win. Strawweight Kal Schwartz put on a wrestling clinic before violently finishing Kay Hansen in the second round. Schwartz controlled the clinch throughout the first round, scoring with short punches and knees. Hansen broke free for a moment, but was quickly slammed to the canvas. That was a precursor to what would come in round two as Schwartz opened a huge cut on Hansen’s face with an elbow before suplexing her to the ground. Schwartz sensed the finish was near and flurried hard to force the referee to intervene. In a pairing of bantamweight newcomers, New Hampshire’s Kerri Kenneson edged Chelsea Chandler after three thrilling rounds. Chandler’s grappling arsenal was the story early in the fight as she repeatedly attacked Kenneson with choke attempts, but Kenneson turned the tide with a massive left hand to close the opening round. Chandler continued to attack the limbs of Kenneson, but she left herself exposed to ground and pound. Kenneson was forced to defend a deep triangle choke in the third round, but her offensive output was more than enough to secure the decision nod. Jillian DeCoursey remained undefeated, handing Invicta newcomer Rebekah Levine her first defeat in their atomweight match-up. LeVine sought the takedown early in the fight, but quickly fell into the dangerous guard of DeCoursey. The BJJ brown belt attacked with numerous armbars from her back, forcing LeVine to defend. As the fight progressed, DeCoursey showcased her superior grappling game, frequently moving to mount and dropping punches. LeVine proved her toughness by making it to the final bell, but DeCoursey claimed the clear-cut decision victory. Flyweights Tracy Cortez and Kaytlin Neil kicked off the action with a back-and-forth battle that went to the scorecards. Cortez was aggressive throughout, pressing forward and keeping Neil with her back to the fence. Neil was able to score with a hip toss in the middle stanza, but she struggled to maintain top position. The final frame was full of scrambles and submission attempts, but it was the relentless pressure of Cortez that was rewarded by the judges. 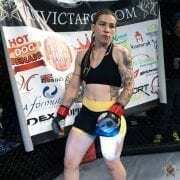 Wer had our 1st invicta fight party-and it was the Bomb!!! Tough a** girls scrapping it out to the fullest! !